﻿Bruce Goodman's "It was Christmas Day!" 1206. It was Christmas Day! It was Christmas Day! It was also Patsy’s first Christmas for fifty three years without her husband who had passed away in June. Both her children were overseas; one on military duty and the other in the diplomatic corps. Patsy purchased an hors d'oeuvre (“Do not defrost, heat in oven for ten minutes”), the biggest chicken to roast that she could find (“But for Christmas I shall cook it like a turkey”), and a host of vegetables as side dishes (“Different enough from the usual to make it celebrational”). But what a stormy Christmas Day! Snow flurries and sudden gusts of wind! And then the electricity went off. A black out. Everything was only half cooked. 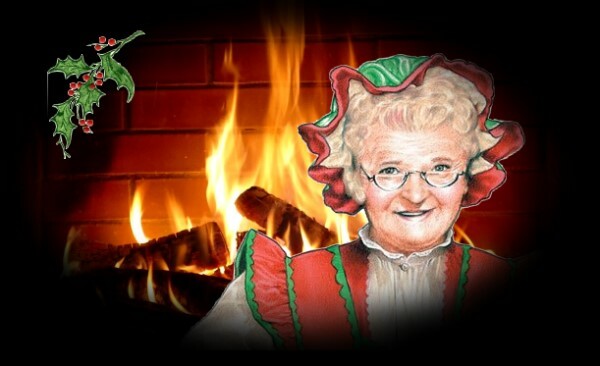 Patsy sat wrapped up next to the fire and roasted her marsh mellows on a stick. Oh! She almost forgot! A little wine!